A short survey of the origins of feng shui and its impact on Chinese architecture, landscaping, and design. South of the Imperial Palace in Beijing, the Temple of Heaven was intentionally shaped to symbolize the emperor’s ascent from earth (the square plaza). The Emperor’s ascent follows steps arranged in variables of three and nine to the circular (heaven-like) shrine; it then passes over stone plaques with depictions of stylized mountains and clouds, further emphasizing the heavenly destination. In the shrine, the emperor made sacrifices and prayed for good fortune for the empire. Since ancient times, the Chinese have traced success or failure not so much to their own efforts, but to the workings of earth forces known as feng shui. Feng shui was credited with determining health, prosperity, and good fortune. Ancient Chinese emperors consulted feng shui experts before building huge public works or waging war. The rise to power of Chinese Nationalist leader Chiang Kai-shek (1887-1975) was traced to the good feng shui of his mother’s grave. His downfall is blamed on the Communists digging it up. To fully appreciate and understand how feng shui works today, knowledge of its background — its history and underlying principles — is crucial. This lesson will briefly trace feng shui’s origins and then provide a short survey of how this ancient practice helped shape Chinese architecture, landscaping, and design over the past 5,000 years. This lesson will introduce the rules, concepts, and tools that continue to impact Asian design today and are now being employed to some extent in the West. Feng shui’s roots spring from the beginnings of Chinese civilization. As early Chinese farmers settled along the Yellow and Wei River valleys, they had many sites to choose from. They naturally sought locations where it was comfortable to live and easiest to survive. This often meant building on a hill, facing south, safely above a river with access to water, but high enough to avoid floods. Protected to the north by a hill, this spot was sheltered from northern winds. There, man and his flocks thrived among warm sun, ample, clear water, and abundant crops. The early Chinese saw a magical link between man and the landscape; that nature reacts to any change and that reaction resounds in man. They saw the earth and cosmos as part of a sacred metabolic system. Everything pulsed with life. The Chinese felt they shared a fate with the earth: when it was healthy and prospered, they thrived, when the balance was destroyed, they suffered. So the Chinese took great pains to enhance the environment and not deplete or harm it, which would hurt chances for good fortune. To the Chinese, the earth was animate, one “living, breathing organism.” They ascribed to nature not only a “breath” — ch’i — but also animal and human characteristics. A mountain might be a powerful, but benevolent dragon; an overhang might be a tiger’s jaw. An entire branch of feng shui is called the School of Forms and interprets the landscape — be it a mountain, a river, or a rock — by detecting shapes. With this highly metaphoric approach to nature, the Chinese avoided tampering with natural surroundings in order not to disrupt the earth’s flesh. The Great Wall is a classic example. Built over two thousand years ago by the first emperor of China to unite and defend the empire, it covers 1,300 miles as the crow flies. But in fact, it is twice that length as it was built twisting and turning along every earthly deviation to avoid rupturing the earth — or severing a dragon’s vein. 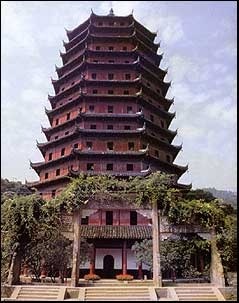 The ancient Chinese also took care with the location and shape of buildings. The perfect site of a house was nestled in a protective hill formation of powerful earthly beasts: built halfway up and backed by a high black “tortoise” hill to the north and flanked by a fierce “white tiger” to the west who is kept in check by a slightly green “dragon” to the east and facing a lovely vermilion “phoenix” to the south. The traditional house shape was a four-building structure arranged around a courtyard — a balance of living quarters and nature — and ideally faced south or east. This house shape seemed to geometrically mimic the protective mountain formation of tortoise, tiger, dragon, and phoenix. Feng shui supports modern ideas of ecology and conservation, as it is based on ancient desires to harmonize with, not struggle against, nature. From this observation and reverence of nature sprang early Chinese religion and philosophy (Taoism), science (geology, astronomy, magnetism), superstition (astrology, fortune telling, shamanism) and — a combination of all three — feng shui. Read Chapter 2 of Interior Design With Feng Shui to glean a bit of the basics of Chinese religion and thought that informed feng shui then and now. The ancient Druids, like the Chinese, traced lines of energy through the earth. These energy channels, or “dragon points,” are used as guiding points by feng shui practitioners to enrich the lives of the areas inhabitants. Philosophically, feng shui seeks to replicate the balance and perfection of the universe as well as harmonize with nature. These concepts of balance and harmony arise from Taoism. “Tao” of Taoism means way, or road. Tao is the eternal rhythm of the universe and how the universe works. It is also the “way” of man. Both the universe and man follow the same natural law — Tao. According to Taoism, two primordial forces, yin and yang, govern the universe. Yin and yang are opposites. Yin is dark, female, and inactive. Yang is light, male, and active. Together, they symbolize harmony, which is Tao. Yin and yang are complementary and interdependent. All things contain varying degrees of yin and yang. Yin and yang continually interact, creating constant, cyclical change: day gives way to night; sun is replaced by the moon only to return, and the process repeats itself. In feng shui, a balance of yin and yang is crucial to creating a harmonious environment. Out of the dynamic interworkings of yin and yang comes ch’i. Ch’i is the most important concept of feng shui. Ch’i is a vital force that enlivens plants and animals, creates mountains, moves rivers and streams, and animates humans, sending us along a life course. Ch’i flows in and through the air, within the earth, shaping its topography, and within our own bodies, determining our health, personalities, and destinies. The aims of feng shui are to locate sites with the best environmental ch’i and then to harmonize or manipulate its flow to benefit the ch’i of residents, as well as to divert or convert the flow of harmful ch’i. Feng shui to many Chinese today is a bit of a dichotomy. Many Chinese view feng shui as a superstition, and yet they will employ its rules when designing or decorating a home or moving into a new place of business. Many Chinese regard feng shui, in spite of its superstitious status, as also a useful and practical tool in ensuring a positive, comfortable, and prosperous life. In spite of its ancient roots and underlying idealized philosophy, feng shui is very much in use today in Asia. Survival and harmony with the environment may not be motivating factors in a businessman’s choice to employ feng shui, but pragmatism and environmentally putting one’s best foot forward may be. Though officially suppressed by the government of the People’s Republic of China as a revisionist superstition, feng shui is still widely used in China, mostly in the countryside and villages. Feng shui groves — trees used to shield farms and villages from northern winds, fast roads, ugly developments, and noise of passing trains, as well as to deter soil erosion — are visible in rural areas. The groves are indicators of positive ch’i and foster good ch’i growth. In the cities such as Beijing and Shanghai, apartments with good views and the best feng shui, not surprisingly, are the most desirable. Beijing’s choice for its first non-colonial governor, a businessman himself, opted to employ a feng shui master to select the most beneficial and powerful location from which to oversee the former British colony. The master wisely advised him not to step in his predecessor’s shoes and move into the colonial government house, but to seek new and more auspicious quarters. In the last decade, Asia experienced enormous expansion and feng shui was often a major consideration for both architecture firms and property developers alike in the design of large high-rises. While nature is less of a consideration, many of feng shui’s ancient rules and concepts are now applied to the changing Asian urban topography, where roads have replaced rivers and buildings are now symbolically analyzed the way mountains once were. Whether sanctioned by the government or not, feng shui is part of the fabric of Chinese culture. And whether in the east or the west, the siting of a home is still important today. A house positioned on a gentle slope with a view of water is as desirable today as it was hundreds of years ago. Early Chinese warriors wore mirrors on their chests or their shields to ward off enemies and demons. Hung outside a home, mirrors are thought to deflect negative ch’i from roads that may aim at the house, towering or ugly neighboring buildings, or a nearby funeral home or police station. They are also used to bring in positive influences such as a view of a park or water to endow the home with good ch’i and good luck. While feng shui often interferes with modern design statements, it is rarely a total roadblock. In my experience, feng shui can help inform modern design. Master Lin Yun taught me years ago about the “Nine Basic Cures,” which are remedies that can alter, moderate, or enhance ch’i. They are as follows. To find out more about the properties and uses of these cures, read pages 21-25 in Interior Design with Feng Shui — I bet “others” is a bit baffling! We’ll talk more about cures as we progress through the course and different applications of them come up. You’ll start to see patterns of use, however, if you pay attention. By the end of the course you should be able to guess what cures might be applied to different imbalances. 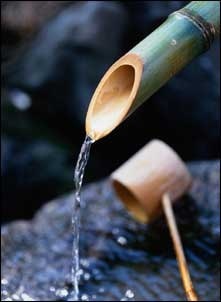 Water & hallow objects, like bamboo, are used as cures. There is no simple explanation to why feng shui cures work. The cures work on many levels and for many reasons. They address how we react visually and emotionally to our immediate environment. Sometimes they work because they are practical solutions –tools to healing poorly designed spaces. Other times they psychologically or symbolically address a design issue or personal wish or need. There may be no rational reason why a cure might succeed, and yet it works. Mirrors, for instance, known as the “aspirin of feng shui,” can alleviate many feng shui problems ranging from awkward room shapes, unbalanced views, threatening corners, and slanted or oppressively close walls to a poorly located bed, desk, or stove. Once you comprehend the uses of mirrors, other cures are all common sense. On the other hand, the Chinese have endowed mirrors with special powers that can be both psychological and illogical. The mystic appeal of mirrors can be traced to early Chinese civilization. During the Chou dynasty (1122-256 BC), bronze mirrors were said to reflect much more than mere images, representing the light of the sun and the moon combined, and able to communicate the intention of the powers of earth beneath and the spirits above. Read pages 6-25 in Interior Design with Feng Shui and peruse pages 18-97 in Feng Shui Design. Think about the lives of you, your family, and your friends. You might want to make a list of the people close to you, or list them by family. Have there been any changes in relationships, health, or personality after you/they changed their living environments (via a move, redecoration, renovation, etc)? What were those changes? Try not to self-edit during this exercise. No event is too small or too strange. Put down your initial responses without over-thinking them; you can always return to that person/family and think more about other changes that have taken place. Sometimes making a list like this yields powerful realization of changes that we hadn’t paid notice to before. Again, please allow yourself plenty of time to sit and think about this. I’d love to read about some of your discoveries on the Message Board.